Southampton Jobs Fair Local is a continuing initiative led by the Employment and Skills team at Southampton City Council to give people the opportunity for face to face engagement with handpicked employers who are willing to support individuals into employment. These events are supportive and friendly and are a real chance for you to find employment, as well as get support from local organisations and training providers. Our Jobs Fairs are free for people to attend and free for employers to exhibit at. If you are an employer who would like to exhibit at one of our future Jobs Fairs, please contact daniel.stickland@southampton.gov.uk for more information. 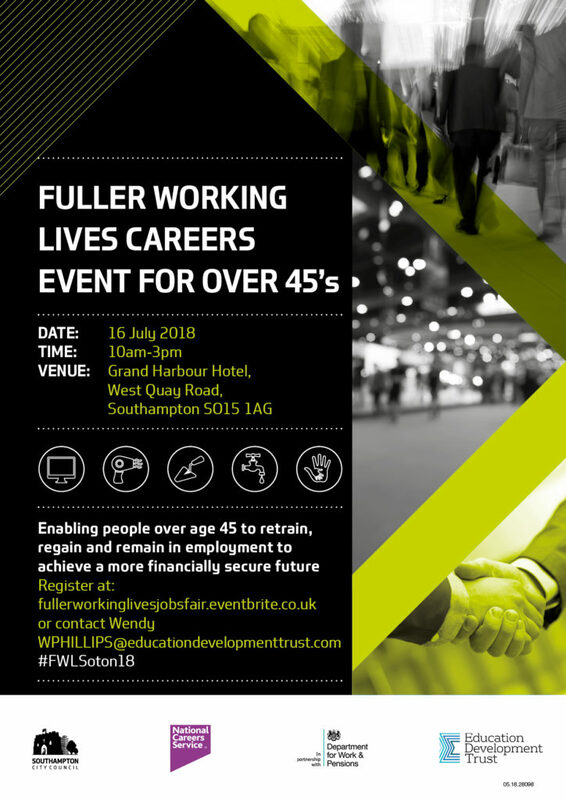 On Monday 16th July 2018, we hosted a Fuller Working Lives Careers Event in partnership with Southampton Jobcentre and the Education Development Trust at the Grand Harbour Hotel. This was an opportunity for people in Southampton to meet employers, training providers and support organisations to help them to retrain, regain or remain in employment to achieve a more financially secure future. At this event, people also had the chance to participate in free workshops to help improve their employability skills.